The Farr Place: Knots 101: Learning to tie one on the right way! In my humble opinion, I think our God-Bless American children are not getting the education they need, that we pay for, and that was mandated by the government and we just went along with it because it got those little buggers out of our hair for most of the day so we could go to work and pay taxes that help support education. And what are they learning? Things like Calculus, Information Technology, Analytical Chemistry, The History of Linguistics and a lot of other high-falutin' courses that may impress you and the horse you rode in on, but it doesn't mean squat when they need to secure a tarp over a truckload of stuff they're bringing home from college. 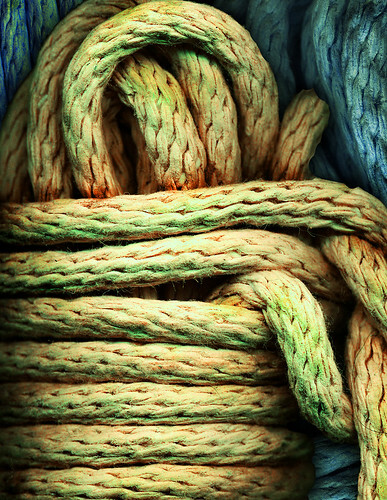 Our kids need to know how to tie knots! Okay, your car slid off an icy road. You're stuck in a ditch. A truck comes along but the driver doesn't have a chain to pull you out. Instead, he has rope. You tie one of those "pull my car out of the ditch" knots, and away you go! Oh, you don't know how to tie one of those knots? You didn't learn that in school? But you do know how to dissect a pig? Well, I'm sure that will get your car out of the ditch! Our God-Bless American kids need to learn how to tie a bowline. They need to be proficient at tying a sheet bend. And they should be able to tie a clove hitch in their sleep. Sounds pretty scholarly to me. Anyways, I needed to tie a knot the other day and I only knew the Granny knot. And since I would never blame myself for being "knot stupid", I put the blame squarely on the shoulders of our education system. Are you Government Education folk listening? Knot Theory! Let's teach our kids how to properly tie one on!